Slocum Puzzle Foundation, 9781890980153, 144pp. 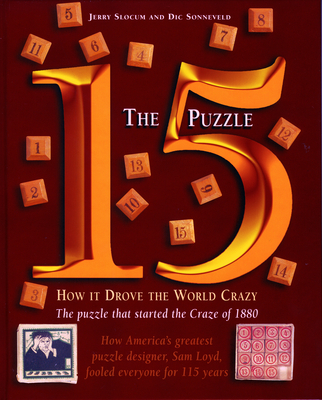 The 15 Puzzle Book contains an illustrated history of one of the most popular and important mechanical puzzles of all time. It can be argued that the 15 Puzzle in 1880 had the greatest impact on American and European society of any mechanical puzzle the world has ever known. Books by famous mathematicians tell that a deaf mute invented the 15 Puzzle but other sources claim it was invented by Sam Loyd, who Martin Gardner called, "America's greatest puzzle designer." Or has Sam Loyd, who claimed to invent the puzzle, continued to fool the world for more than 100 years? - The real inventor and his patent application records were found. - The story of how the puzzle came to be manufactured. - Proof that the 15 Puzzle is mathematically impossible to solve. - How a young New Yorker solved it. - The worldwide puzzle craze that it created. Jerry Slocum is author of many books including, The Tangram Book, The Puzzle Arcade, Swipe this Pencil, and Tricky Optical Illusions.Dic Sonneveld works at Leiden University in the Netherlands.